The skill of an opponent is sometimes measured by the respect afforded him by the loyal opposition. Whereas Russian writers have little respect for “Saint” Michael Wittmann, it is a much different story with legendary Tiger tank commander Otto Carius. Part of it is due to the fact that (as esteemed German armor researcher Tom Jentz has pointed out for some time) Wittmann got away with much and received much of the praise heaped upon him for being a good Nazi and an SS tanker. Carius, a Wehrmacht tanker, had to earn his praise the hard way but was more honest about his results. The Russians note that contrary to popular myth the Germans weren’t much better at long range shots than the Red Army tankers were; they were trained to shoot at more distant targets whereas the Soviets only trained their gunners to engage at 750 meters or less. Too many popular myths have Wittmann credited with killing off any tank with one shot at 1,800 meters or more. Carius accounts for a much more involved process and in one case shows that in order to kill 84 Soviet tanks in July 1944 a total of 555 rounds of AP were fired, or an average of 6.6 per destroyed tank. Russians give credit where deserved, but appreciate a more honest assessment! I believe the period noted for this kit is a fight that took place around what Carius called “Malinava” between 23-26 July 1944, which noted the first time his company ran up against early production IS-2 heavy tanks. An ambush accounted for 17 of the new tanks over two days as well as five T-34-85 tanks (which Carius calls “T-43s”). 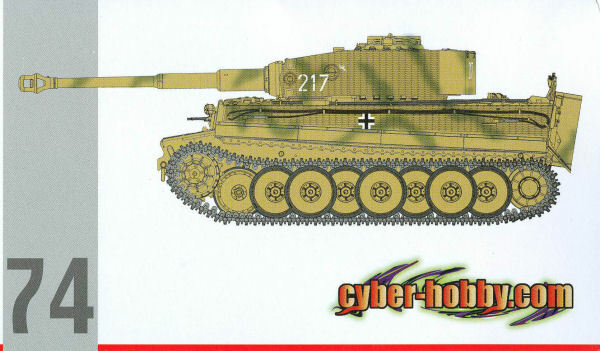 While Caruis’ very interesting autobiography “Tigers in the Mud” has numerous pictures of his first Tiger I (bort number 213) this kit is apparently of a later tank (bort number 217) which has both factory zimmerit and also the standard production cupola. Like the earlier tanks, it is modeled with its front outer road wheel removed. I leave it to the serious Tiger I researchers to vouchsafe for its accuracy. This kit comes with the DS Plastic single piece runs and replicates the “universal” tracks (installed facing different directions). As previously noted, the DS plastic looks good, takes paint well, and glues with common plastic solvents; it also permits undercutting such as the pin ends of the track and even open teeth to replicate castings as is the case here. Overall, cleanup is simple and I do believe most people like these better. However, the “sag guides” from previous kits are now missing. There are fewer options with the kit: the box does include two styles of idlers, two different rear plates, and three different mantlets, but as this tank is designed to match a specific vehicle with much more known information most of them will have to go to the spares box. It comes with the later commander’s cupola and other specific parts. As before a partial interior is included for the engine compartment as well as all of the torsion bars and the 8.8 cm gun breech in the turret. While the mount for the AA MG is provided, this time no extra MG34 is provided. The amount of etched brass has been reduced, and my take on that is that the molds have all been “tweaked” a bit to clean up earlier problems and thus much of the brass detailing is now superfluous. Zimmerit molding is confined to the lower glacis (T2), upper glacis (T4), vertical plate (T5), hull sides (T7 and T8), stern plate (T3), turret shell (T9), and the mantlets (T6 or T12). But the previous three patch panels used to provide smooth surfaces for markings on the vertical plate are missing as the directions show the markings going right over the zimmerit. Technical assistance and research for this kit came from David Byrden, Tom Cockle and Gary Edmundson. The kit comes with a nice sheet of targeted Cartograf decals with two options: Carius’ tank at Malinava, July 1944 (green bands over sand, white 217); or the same tank, Narva Offensive March 1944 (whitewash over sand, black 217). An extra set of “Red 217" numbers are also included. Overall this is again a very popular subject and with the the addition of factory applied zimmerit and DS tracks will make it easy to get a realistic model from the kit. Note that these kits quickly move to ridiculous prices on eBay and other sites so anyone wishing one should snap it up quickly ($200 each for previous ones is not uncommon).